2006 Mako 264 CC Launched in 2008 WITH THE POWER TO HANDLE HEAVY SEAS AND THE RUGGED, GOOD LOOKS MAAKO IS KNOWN FOR, THE 264 CENTER CONSOLE HAS THE SIZE AND SPEED NEEDED FOR OPEN WATERS. SHE IS BUILT IN THE MAKO TRADITION AND WITH HER AGGRESSIVE DEEP-V HULL SHE HAS A SMOOTH, DRY RIDE AND A LONG LIST OF STANDARD EQUIPMENT. SHE ALSO HAS A ONE-PIECE, FOAM INJECTED FIBERGLASS STRINGER GRID THAT PROVIDES STRENGTH AND RIGIDITY. 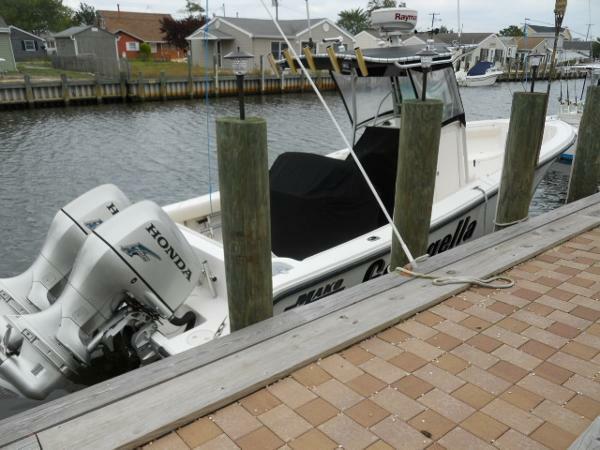 "GEORGELLA" IS POWERED WITH THE PREFERRED HONDA 200 HP 4-STROKE OUTBOARDS THAT HAVE ONLY 300 HOURS ON THEM. SHE HAS A RAYMARINE ELECTRONICS PACKAGE, AN ENCLOSED HEAD/CHANGING COMPARTMENT, ALL FISHING AMMENITIES AND HAS BEEN PROFESSIONALLY MAINTAINED SINCE NEW. SHE JUST HAD BOTH WATER PUMPS REPLACED AND IS READY TO TAKE YOU WHERE THE FISH ARE BITING. 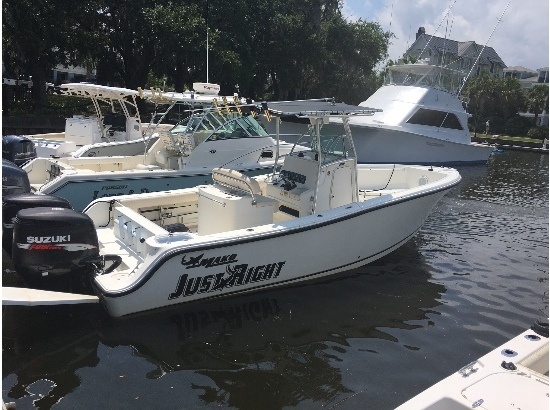 IF YOU ARE LOOKING FOR A MID-SIZE CENTER CONSOLE THAT IS EQUALLY SUITABLE FOR SERIOUS OFFSHORE FISHING OR JUST STAYING INSIDE WITH THE FAMILY ENJOYING A DAY ON THE WATER, COME CHECK HER OUT. SHE WILL NOT DISAPPOINT! OFFERS ARE ENCOURAGED AND WILL BE GIVEN SERIOUS CONSIDERATION..... TRADES POSSIBLE!!! 2007 Mako 264 CC with twin saltwater 225 HP engines w/190 hrs. Rigged for serious fishing. 32 & 16 gal live wells, 2 large fish boxes w/auto drain, custom helm station, full electronics, fuel flow guage and full coast guard safety equipment. MP3, CD, 4 spkr stereo. full maintenance records. 25% below value at $52,500. Call 305-289-1771 (Florida Keys.